Onew had sat up all night thinking. And now, the following morning - he was studying the fancy invitation in his hands with a strange look on his face; he looked as if he was being strangled by invisible hands. Onew had decided long ago that he was going to turn up to their wedding, whether it was going to break his heart or not. He was going show his face for Ji-Min, and Ji-Min only - not her boring husband who she was being forced to marry. Onew knew that it was irrational and childish to despise a man he had never even met, but the fact that he was in the way of his happiness was more than enough reason for him. And all Onew could do was dress up in an expensive suit, style his hair and put on some makeup, grimacing at himself in an attempt of a smile as he stared at his face in the mirror. "Onew?" He heard a knock on the door and a head poked around to find Onew sitting at the end of his bed with the invitation still in his hands. It had gotten to the point where Onew&apos;s nerves had turned his hands into fists and the delicate paper was completely crumpled in his fist. "Onew, are you okay?" Key slipped in and closed the door behind him again, looking at Onew with sad eyes. "Don&apos;t pity me," Onew said suddenly, standing up as he through the invitation on the ground. "Please don&apos;t."
Key just shook his head and pulled him into a hug. "You know what I said last night?" 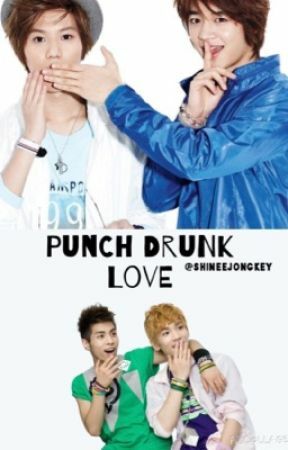 Key whispered and Onew nodded against his shoulder. "I don&apos;t think you should do any of that. I think you should just do what you think is right." Onew stood frozen for a moment, unable to hug the younger boy back. What was the right thing? Was the right thing to barge in and call off the wedding, declare his love for Ji-Min and carry her out of the church immediately? Or was it to stand in the crowd, cheering and smiling and he lost her to another man? Or he could just not show up at all. But that was definitely not the right thing. "What&apos;s the right thing, Key?" Onew&apos;s head was starting to hurt as he thought of all the possible things he could do. But none of them seemed to fit. He sure as Hell wasn&apos;t going to embarrass himself and Ji-Min in front of all her family and friends by ruining her own wedding, but neither was he going to sit back and watch as the only person he had ever truly had feelings for disappeared out of reach. Key just shrugged, pulling back from Onew. He shot the older boy another sad smile before retreating back out of the room. Onew was completely lost: if Key didn&apos;t know what to do, then no one would. Key was always the one with a solution - even if they were always extreme and almost always never worked out. But the fact that Key had absolutely nothing was just about enough to drive him insane. Onew stood outside the church, straightening out his tie and scuffing his shoes on the floor. Key was mouthing phrases of encouragement from his car that he had parked on the side of the road, but Onew knew that he was going to have to drive away once people started arriving. Onew had turned up fifteen minutes early - just in case. Just in case for what? He didn&apos;t know, but the nerves were already piling up as the first few people arrived. The sky was cloudy and dark - a sure sign of rain - but Onew couldn&apos;t bring himself to enter the warmth on the church with all the other guests giving him odd looks. None of them knew who he was, obviously. Or if they did, they were too embarrassed or nervous to approach him. Then Key drove away with a look that said, "I&apos;m sorry." And finally, all the guests had arrived and they were filing into the church and choosing their seats. Onew thought it was nice that Ji-Min had persuaded her fiance to have a traditional wedding in their local church, because that&apos;s exactly what Onew would&apos;ve wanted if it was his own wedding. But it wasn&apos;t his own: it was theirs, and Onew was a mere guest. He followed the others, weaving in and out of Ji-Min&apos;s relatives and friends until he found an empty seat at the very back. As ridiculous and as conceited as it sounded, Onew only sat out of view so that Ji-Min didn&apos;t see him and decide that she&apos;d rather spend her life with him instead of the stranger she was to marry. Except that wasn&apos;t it. He wasn&apos;t sitting at the back because he was scared Ji-Min would run to him, it was because he was scared that he would run to her. And that seemed like such an Onew thing to do. He was afraid that he&apos;d take one look at her - in a beautiful white gown and her makeup done professionally - and fall in love with her all over again. It seemed like a likely thing to happen, hence why he chose to sit behind an elderly couple who mostly blocked his view of the alter. Everyone settled down, and once the church was silent, music started to play. The sort of music you heard at weddings, that was for sure. The sound of the organs sent shivers down Onew&apos;s spine as he spun his head around watch the entrance of the church, waiting for Ji-Min to appear. That&apos;s when Onew realised that the right thing would&apos;ve been to stay at home and not interfere with her life anymore.